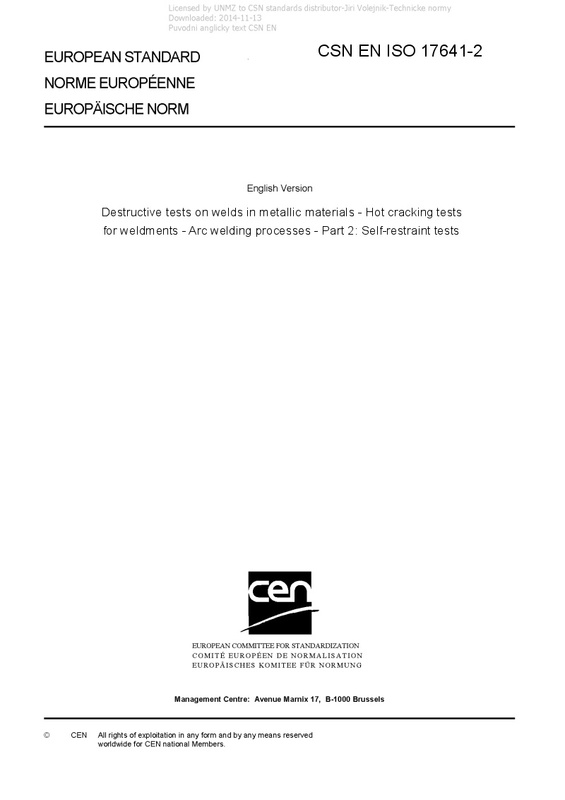 EN ISO 17641-2 Destructive tests on welds in metallic materials - Hot cracking tests for weldments - Arc welding processes - Part 2: Self-restraint tests - ISO 17641-2:2015 specifies the required specimens, the test piece dimensions, and the procedures to be followed to carry out self-restraint hot cracking tests. The following tests are described: - T-joint weld cracking test; - weld metal tensile test; - longitudinal bend test. The tests are designed to provide information about the hot cracking sensitivity of weld metals. The tests are not suitable for the assessment of parent materials. ISO 17641-2:2015 applies primarily to fully austenitic stainless steels, nickel, nickel base, and nickel copper weld metals. This part of ISO 17641 can also be used for other weld metals. ISO 17641-2:2015 describes only how to carry out the tests and report the results. It does not give any acceptance criteria.